East manhattan is currently any area located east of sepulveda boulevard. Within "East Manhattan", the area south of Manhattan Beach Blvd. is officially called the Mira Costa Area (MLS 147). It allows the easiest commute to the Middle and High Schools as both are located East of Sepulveda, as well as excellent proximity to popular local commuter routes. 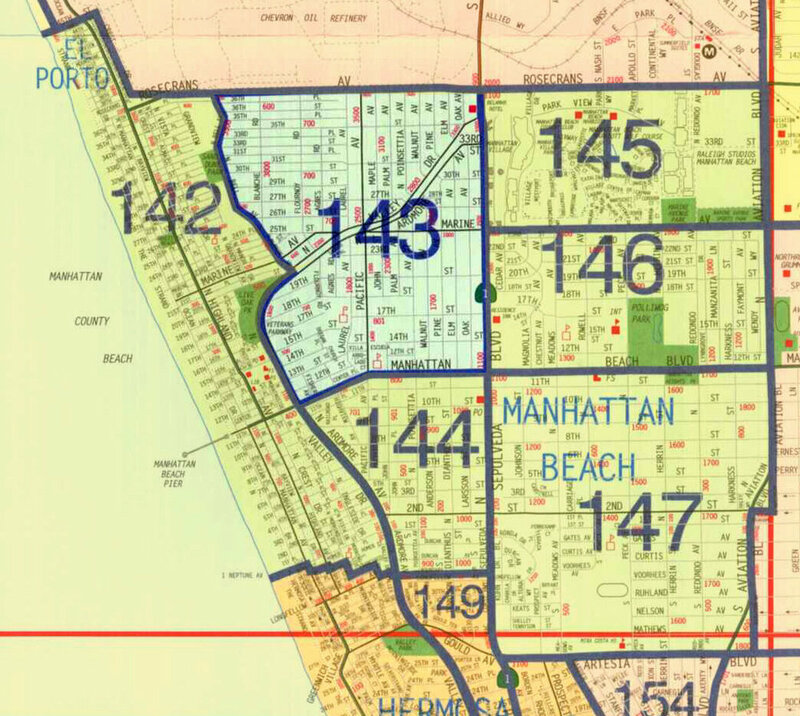 Manhattan Heights (MLS 146) covers the remaining area to the west of Liberty Village, running from Redondo Ave. to Sepulveda Blvd. Also referred to as East Manhattan, Manhattan Heights differs only slightly from Liberty Village in that a different developer carved out lots closer to the 50×150 size and a section of streets are more akin to a TRW tract, with a gentle curve to the street, rather than a city grid. Here, because of the gentle upslope of the original landscape many lots offer beautiful views of downtown LA and the Los Angeles mountains. The Sand Section is bordered by the Pacific Ocean to the west, Valley Avenue and the Tree Section to the east covering both North and South Manhattan. It really signifies the homes that are near the beach. Additionally, it earned its namesake since most of the homes were built on the original Sand Dunes that existed before it was developed. This area is known for the smallest lot sizes in the beach area, some as small as 1345 square feet or 30 feet by 45 feet which is about one half of what is considered a full size lot. A full sized lot is approximately 30 feet by 90 feet or a total of 2700 square feet. The side set back on these lots is typically 3 feet which ultimately means you are approximately 6 feet from your neighbors. Homes are usually either 2 or 3 stories depending on the zoning and location. Parts of the area have zoning to allow the development of townhomes/condos, many of which offer beautiful ocean and coastal views. Most of the properties are located walking distance to the central or north end commercial districts known for its great restaurants and quaint shops. You will also find what are called “walk streets”. These streets do not allow automobile traffic increasing their desirability. The flat walk streets have become extremely popular with families as many of the children are able to enjoy and play in the streets that have zero traffic. The sloped “walk streets” often enjoy incredible ocean vistas. Not including The Strand (oceanfront) properties, prices vary dramatically in the Sand Section anywhere from the high $1 Million range up to $17 Million for a 12,000 square foot home on two and half lots with ocean views. You could call it “Billionaires Row”, and although you don’t need a billion dollars to own there, it does attract them. This is front row living at its finest. Many own some of the most beautiful homes ever created and choose this iconic stretch of the beach as their home away from home. They often become second, third or fourth homes; a place to visit and relax in one of the best climates on the entire globe. The Strand is the row of homes that sit directly on the beach. It starts at the northern border of Hermosa Beach and ends at the southern border of El Segundo. As of 2018, prices start at around $7 Million and continue far up the ladder from there. This area is south of Manhattan Beach Blvd., West of Sepulveda to Ardmore, and bordering Hermosa Beach to the South. This is the one of the more prestigious residential sections of Manhattan Beach offering larger lots, many of which have panoramic vistas of the Pacific Ocean. Some of the largest homes in town are built here and sell for millions of dollars. This is one of the only areas where you can get a large home, a large lot and have ocean views. If you get all of those it comes with a pretty large price tag. The larger lots as of 2018 have been selling around $6 million and finished homes have sold as high as $20 million. Bordered by the Sand Section to the west, Rosecrans Ave. to the north, Sepulveda to the east and Manhattan Beach Blvd. to the south, the Tree Section received its namesake from the street names, most of which are, well, tree names. This area offers slightly larger lots than the sand section. The lots are typically 40 feet wide and approximately 125 deep allowing a full 8 feet of distance from your neighbors and small back yards. There are many original classic California post war homes with lots of character, intermixed with homes that have been built over the last 2 decades. The newer homes are typically around 3200 square feet as opposed to the original homes that are closer to 1500 square feet. This area can be relatively close to the beach, making beach access a bit easier than the more eastern parts of Manhattan Beach. This area is served by two elementary schools: Grandview and Pacific. As of 2018, new homes in the 3200 sqft range have been selling in the mid $3 million range and smaller homes selling just under $2 million.